This is a minty 25 mm. Confederate cavalry button with the "H T & B/ Manchester" backmark. These pretty buttons were bought by the Confederacy directly from their English manufacturer and run into a Southern port through the Union warship blockage. These are not common in this condition. Believe it or not, this item was discovered in the bottom of an old cigar box full of much later junk! Old collections are a marvellous source of the most exciting items! This Eagle Breastplate was found in the deadly Peach Orchard of Gettysburg during the 1950's before detecting was officially forbidden. It once adorned the chest of a Union troop who would have worn it on his cartridge box shoulder strap. Likely he did not leave the field unscathed... Metal detectors evolved from minesweeper technology in World War II. Soon, industrious collectors were applying their huge primitive systems to Civil War battle sites. The debate still rages hotly: Do we dig up the relics in order to remember the dead who carried them, or do we leave such items in the ground to corrode away beside the dead who rest??? No matter what you believe, digging on government lands is absolutely NOT allowed now, under threat of very stiff penalties. And permission must always be gotten from the owners of private lands. This is a Union smoothside canteen of Civil War vintage. Soldiers used to cook meals over camp fires in half of a split canteen. The cloth cover was originally blue but quickly faded and tattered with field use. Few of these CW canteens made it home with any cover at all. Its three strap loops were sufficient for toting it with a basic strap. This artifact still has its original canvas sling which is stamped in ink "Aug.12,1864" The cork is tethered by a chain and the pewter spout is maker marked. Zouave buttons were rounded "ball buttons" most often gilded in shiny brass but sometimes silvered. They were worn in long single or double rows upon showy Zouave frock coats or doublets. Earlier buttons had makers "marks" or manufacturer's notation on back of the button surround the sewing eyelet (shank). These buttons are often dug alongside more traditional State and Government-issued uniform buttons. Larger one is coat sized, non-dug specimen at 18 millimeters. Smaller is a dug vest. Backmark on brass example reads: Scovill Mfg Co. Waterbury", while the silvered coat marking reads "Extra Rich" referring to the richness or thickness of the silver plating. This is a coat sized Confederate officer's button for General Staff, known as a droop wing variety. Normally, it would've been sewn in a double-breasted row down the front of the officer's jacket or frock coat. Dug buttons are amazingly sturdy little things. It is hard to imagine that after 140 years of freezing and thawing underground, they still are excavated looking just like this. Of course, a lot has to do with the chemical condition of the soil and its water-table. Some buttons get a "ground-action" or surface corrosion from the effect of minerals or water in their environment. Others barely change and even manage to keep a fair degree of gold "gilt" to their face designs. As in this example, the remaining gilt sets off the design of the eagle beautifully. Sometimes buttons were made with tin or iron backpieces which tended to rust through much more quickly than brass backs. The shank or upright loop at the back for sewing the button to the coat can either be intact, bent, or broken off. Many times, the manufacturer of the button would mark the back with his company name(called a backmark...) But in this case, there is a blank backpiece with no maker being so named. When buttons were cast quickly in local shops, these "locals" often had similar blank backs. Such is the case with many Confederate buttons. This measures 21 mm diameter. This is a beautiful preserved crossed saber hat insignia in 3 3/8" brass. Has all four wire loops soldered in back as per CW. Nice oaky-brown patina. From an old collection. Probably was surplus at end of CW war. These are getting tough!!! NICE!!! Civil War Officer's Eagle Sword Belt Plate and Belt. A cast-brass Officer's Sword Belt plate of fine quality~ numbered on the hook with a matching keeper, both held on an original ribbed-style belt with one of its two hangers still remaining. The sword belt hangers attached by clips to the carrying-rings of a sword's scabbard. 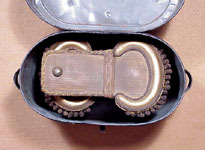 Some were adapted with two sets of clips, a higher positioned one (shown here) for walking and then the longer hangers meant for riding horses. After putting on his coat, an officer could simply latch together the heavy buckle to hold his sword rig up by the tight fit of his sword belt. A quick way to scamper off to battle. This was recently found in a barn in Maine! Regulations were not strictly enforced on officer's uniforms during the Civil War, especially during the early rush to get large numbers of commissioned leaders into the field. Thus, many accourements were special-ordered from local supply houses which took proud liberties with both the size and design-complexity. Thus, during the Civil War only, these rank shoulder boards (or straps) often sported double or triple borders. To the Armies of the North & South, size apparently did matter: with bigger beards, bigger cannon and bigger straps. All well and good until snipers started selectively picking off officers at a great distance with sad success. Near the end of the war, permission was officially given by the War Office not to wear them in active fighting areas. This one shows the gold oak leaf of a major with a blue field of nap for Infantry. The black cotton backing has moth nips. These boards were usually built upon a slab of stiffened burlap, cardboard or canvas. Measures slightly bigger than regulation size: 2 1/4" wide x 4 1/4" long. These are a very nice set of Civil War Period officer's epaulettes in their original tin carrying case. They wqere worn on the shoulders when in full dress parade or formal events. There are some initials scratched onto the lid. The underside is padded with yellow velvet. A sapling actually grew up through an old Union roller buckle in the ground! Found by a collector in the Falmouth area. Perhaps from a knapsack buckle or cavalry strap. Measures 2" x 1 3/8". Tree section is 8 1/2 inches long. What an oddity! Found scattered about campsites and battlefields are various metal attachments that survived the rigors of being underground for over 100 years before metal detectors evolved to allow their discovery. The earth under many battle & skirmish sites is literally peppered with such items. In fact, private fields, forests and farms still yield such relics. The lead and brass items survive very well. But iron rusts and flakes (spalls) away. Very rarely leather & cloth have actually survived in a dry "airlock" location underground. It is fortunate that the soldier's themselves have returned "dust to dust" into the earth. They are at rest. Thus, it is wholly relieving to know that bones and bodies are never found. Ocassionally, the assortment of buttons, plates and weapons at one spot make one wonder if a soldier might have fallen at that spot and left his things behind there. But that man is already with the Greater Spirit. When riding on horseback, the cavalryman often kept his carbine closely-ready by his side through the use of a carbine belt sling draped over his shoulder. The gun was then suspended by a pivoting snap-clip to it. In this way, the soldier could pause and quickly draw up his carbine for firing at the enemy. The carbine sling was a essentially a wide leather belt that was adjustable in overall length to fit the trooper. Thus, it had a strong cast-metal buckle to hold it at the chosen length. This is one such carbine-belt buckle. The "batwing" comes from the free end of the belt, applied much in the same way as modern belts that have metal tips on their ends to pass through the buckles. There is a nice brownish-green patina from the metal gradually toning in the soil. The buckle is marked by its maker: E.Gaylord, Chicopee, Mass, US, and shows the mark of a United States military inspector: T.J.Shepard. This is a very nice example of the French Chasseur Shako. In 1861 the Federal Quartermaster ordered 10,000 complete uniform sets, including these fancy leather "tarbuckets". These were issued to 62nd & 83rd PA, the 18th Mass, and the 49th & 72nd New York Regiments. This example is correct all around. Has the large, original infantry-eagle plate, red-white-blue cockade, and a lovely reddish-orange pom. Marked 5 1/2 inside. There is no chin strap left. Minor inward dip to crown but no cracks or breaks in it. The brim is slightly upturned but solid. Overall, it's sturdy and good-looking. AMAZING BANNERMAN CIVIL WAR RELIC BOX!!! This is a heavy oak shadowbox prepared and sold by Bannerman's Military Supply House in New York City after the Civil War. Fourteen (14) period hat insignia are attached to plush red velvet nap. They include: Model 1858 Infantry Horn; CW Period Engineers Castle; Model 1861 Mounted Rifleman (perpendicular horn); 1834 Infantry Horn (Hanging from tasseled cord); 1822-34 Infantry Eagle; TWO larger 3 5/8" Crossed sabers (1858 Cavalry); Hardee Hat Eagle Plate; Kepi Letters "D" and "F" (one inch) and a gothic Zouave "3"; smaller 1858 Forage Cap Crossed-Cannon; Larger 1858 crossed cannon (more common CW variety) and CW period Ordinance Bomb. It even has the original paper label from Bannerman's still pasted on the rear panel. Proud veterans purchased such wall displays for their homes in order to recall those insignia which were most commonly seen during their days of military service. Dens, libraries, offices and Veterans' Halls often found such display units occupying their walls. There was also a huge market for military-themed paper-weights, jewelry, inkwells, door stops, canes, umbrella stands, flagpole bases, lighting fixtures, and practically any other decorative device related back to "the War". This particular item comes from the estate of an actor who happened to star in Civil War Movies and received this as a gift on one of those film sets. It is interesting to know that the cast of early movies were often costumed with real Civil War guns, swords and uniforms because original surplus items were still considered cheap old junk. CSA Medium Fork-Tongued Belt, Petersburg, VA. This is a "medium" sized CSA fork-tongue buckle that was excavated from Petersburg, VA theater. Kerksis tells us these were sand-cast from copper. 3 1/2" x 2 5/16". They were some of the more common types of "plain" buckles used on the heavy waist belts of Confederate troops. Sturdy, with two thick prongs holding each position, they were much easier to produce than fancy two pieced cuckles of state-seal plates. This has a softer medium brown patina. This is cloth 14th Corps Badge with outlining wire border that attests to its Civil War vintage. This could be sewn to the top of a kepi or applied to a frock coat. 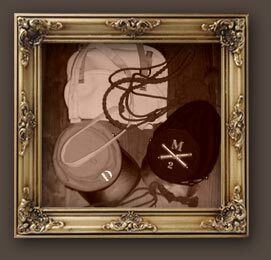 These items tend to be rare, having frequently been discarded over the years along with the moth-damaged caps and coats that bore them. 2 3/8" by 1 1/2". This 5/8 inch brass company letter "J" for the kepi of soldiers shows the fancier or more-flowing Gothic design known now as the "Zouave type." It came from a small box of Civil War items in the estate of Vermont State Quarter Master, General George Franklin Davis. This is a classic CSA "clip corner" belt plate. These were made quickly by local Southern metalshops from sheet brass and soldered on hooks. This one still bears it's prong but has lost the hooks, the probable reason for its being discarded. The site of origin is unknown. 3 1/8" by 2 1/4". This demonstrates the short supply of quality materials available to Southern armies but their determination and resourcefulness in making do. This is an embroidered artillery kepi badge displaying the lined numerical "4" of the regiment. It was sewn onto the front of the soldier's kepi or hat as a designation of artillery and a way to take pride in one's regiment. There is a decorative wire border consistent with Civil War Period or slightly earlier time. The crossed cannon are set on a black velvet field sewn over canvas base. A similar example is shown on page 10 of Laframboise's book on US service insignia. As their uniforms deteriorated, old soldiers preserved the buttons and insignia, sometimes leaving a swatch of uniform cloth with each button. Occasionally, the children would each take one of dad's old war buttons as a remembrance of his service to the Union. This is a State of Maine Staff officer's coat button. The front of this coat button shows the state seal, while the reverse has a circa 1860 impressed SCOVILL MF'G CO. WATERBURY backmark. I am told that this relic came out of an upstate Massachusetts attic. This is a very lovely looking US Belt Plate recovered from Fried Meat Ridge in West Virginia. It has a nice honey patina to its face and an intact back. The small scratches and dings found on such plates demonstrate their "real" character~ having actually been through a tough daily existence with fighting men. By way of these "scars" you know that this baby was really there! The soft patinas to old metal relics are sure signs of honest aging. Thus, we do not over-clean these artifacts, for these are their battle wounds, like some invincible kid coming home smudged from his first street battle against regretful foes. The custom case shows how true collectors can proudly display and enhance their treasures. This is a Civil War Navy Commander's shoulder board or strap. Worn on the frock or officer's coat, these insignia demonstrate rank. Construction of such boards evolved in size, complexity and materials from the Civil War to present day. This item definitely shows the proper Civil War features: size, of 4 inches by 1 1/2 inches; a 1/4 inch border of alternating bright and dull bullion; open back construction on a stiffened burlap board; and device designs.The dark blue nap used for a background field is perfect and the gold oak leaves and anchor in fine condition. Coats were often devoured over the years in closets by moths and eventually discarded. But families often cut off the shoulder boards as more-sturdy momentoes. Naval boards are much more scarce than those of the army officers due to the lesser numbers of sailors verses soldiers. This is a shoulder board for the uniform of a Union Admiral. Amazingly, it was discovered by a junk "picker" up in New England, where it was randomly tossed in a box of cheap assorted stuff. The dimension, open-back construction and use of alterating dead/bright bullion wire in the border indicates a Civil War date of manufacture. The hand workmanship on the stars is especially nice. The cloth backings and velvet nap fields of shoulder boards are a favorite food of closet moths. But the borders, decorative devices and stiffened inner support boards are not. Many rank straps were saved by nostalgic soldiers or their children long-after their frock coats were totally eaten-away by moths and varmints while in storage for decades. Thus, we still see shoulder boards on the modern collecting marketplace, while we do not see the actual uniforms very much outside of sealed museum cases. This is a die-pressed brass insignia worn upright on the kepi of a Union troop in the Mounted Rifles. These were small regiments that were phased out early in the course of the Civil War. Thus, this type of insignia was not produced in large numbers and tends to be uncommon. Nevertheless, we often see these included in displays of insignia made by post-war military companies for collectors from the 1890's onward, so they were certainly known and sought after. For every one of these issured, there were probably tens of thousands of plain "infantry horn" kepi badges issued. It's a full 3 1/2 by 1 1/2" and very finely detailed. The appropriate CW period wire loops are attached with vintage solder. This is a nice, Union officer's "false embroidered" brass kepi insignia from the CW period. The hunting horn was the symbol of the infantry prior to the Civil War. It was changed to a crossed-rifles design immediately afterward during the Indian Wars of the late 1800's. This has brass wire attachments on back for holding it to the front of the kepi or soldier's cap. Using stamped brass to look like fancy threading or embroidery was cheaper and more durable than having a cloth sewn-on insignia actually made by a military clothier. Measures 2 & 7/8" wide by 1 & 3/4". This is a very cool cuff button, a 15 mm lined-A (CSA artillery)by the firm of SKW from Birmingham, England. Found at Malvern Hill, VA. is has no shank but shows the really distinctive maker's backmark. There is a moth with SKW in its body! Neat. ﻿This splendid example of a large, double-bordered Captain rank shoulder board for the Union forces. It comes from the family of Senator Edmund Gibson Ross, a U.S. Senator from Kansas, 1866-71 who served first as a captain and then a major in the Union Army during the Civil War. He later was the Territorrial Governor of New Mexico from 1885-1889. It measures 1 3/4" by 4 3/4" with a closed-back construction. A privately-purchased, custom accoutrement was bought before the Government cracked down on the variations of outside suppliers. This Georgia cartridge box plate comes from an old collection when relic hunting was still legal on the grounds of Gettysburg. It was found in the "Slaughter Pen," that mucky wet woods between Devil's Den and the Little Round Top where quick death rather than survival prevailed. In the freeze-thaw of a watery area, these plates tend to lose their lead and curl-in upon themselves after a hundred years. The central section of this plate remained in excellent condition with the Georgia State Seal's details keeping very clear & crisp. But when found, the edges were deteriorated away. Thus, the rim of this plate has been quite expertly restored. Some fill to the rear lead was also added at edges for looks & stability. It is next to impossible to see the points of repair. The plate has a cupping or curl to it (the way dinner plates are curved up from the table...) due to the freeze-thaw effect. The iron loops are rusted away but their stubs are still vaguely evident. The State Seal is all original and amazing. To think that a Georgian CSA troop fighting on Day Two of Gettysburg carried this most probably to his death, within sight of Chamberlain and the 20th Maine atop the craggy hill ahead is certainly a sombering thought. Completely undamaged plates like this one are usually listed in excess of $3000 due to rarity. Therefore, this is a bargain, especially in consideration of its tremendous site of origin. Naturally it is fully guaranteed. This is so very cool! Shoes or brogans, as well as boots often had their soles and heels attached by use of many little wooden pegs driven into the base of the uppers. We still sometimes find boxes of surplus wooden pegs in old store houses these days. It is clear that these pegs went along with regiments for quick field repairs. Shoes were in such short supply that anything that could be worn WAS worn, better to tear up a crummy brogan than to tear up one's own feet. The South was especially desperate for shoes. In fact, Gettysburg became the site of a momentous battle because leading CSA units had heard rumors that there were stores of shoes in the town. If a piece of foot-wear could be repaired, it WAS! This particular heel comes from a CSA Camp at Brandy Station in Virginia. You can see the pegs protruding through to the inside. To think that this piece of leather was worn down during marches by a man who actually saw the Civil War! Twenty years ago, a post office was being built in Richmond, Virginia and the crews discovered that stores from a Confederate Depot had been buried under that site! Much was already rotted or well-beyond saving, but some items by virtue of the ground drainage and how they were tightly-packed together could still be salvaged. This simple Confederate leather brogan (shoe) was one of about twenty that warranted rescue. Look at the amazing degree of its preservation, considering over 100 years in the ground!!! The construction is typical of shoes that could be made quickly and cheaply in local shops for the Confederate forces who were desperate for any footwear. In fact, Gettysburg became the site of a cataclysmic battle simply because leading CSA forces had heard rumors of shoe supplies being in that city! In any case, notice the tiny wooden peg coinstruction by which the heel & sole are applied to the leather body. When these tiny little wooden pegs are found in tin cans these days, they commonly perplex people as to their original use. In some instances, small metal heel plates and toe taps were added to slowdown the wear on shoes. New diggers often yelp, "Look at the tiny horseshoe I found!" when in actuality, they've discovered a loose iron heelplate. It was a sad state of affairs that men who risked shot and shell often suffered more from blisters and trench foot. After a battle, deceased friend and foe were laid to rest side-by-side. But often without shoes, boots or brogans which could still be used by the living. A wonderful hand-made Infantry Kepi Horn made of bullion wire and sequins over a field of blue nap which has faded to a lime green. This is a common result of age upon the old blue dyes. Bult upon a stiff backing which follows the shape of the horn rather than the usual oval, this was likely worn by an officer. The brass is time-tarnished. The bullion "69" in the center of the hirn is ever-so-slightly raised upon a built up underpillow. A very neat, very hard item to find now. It definitely went to war! These are very interesting: the shoulder boards for a frock coat of a Union Pasddle-Wheel Captain!!! In the Civil War period, paddle wheelers traveled the larger rivers and inland waterways, delivering soldiers, a multitude of supplies and even acting as hospital ships. These demonstrate the typical Civil War period size & construction. The stylized paddle-wheels as their device are very cool! The quite fancy shoulder board of a Union Brigadier General. Worn on the shoulder of a dress uniform. It's construction indicates a rough time-period of 1863 through 1870's. A very neat piece! The workmanship on the general's star and Union shield are awesome! After the war, most officers were permitted to keep their uniforms. This is a very interesting wall display assembled from a Union captain's uniform. We see the slouch hat cord around the edges; the two Union captain's shoulder boards; and an embroidered hunting horn that denotes an Infantry regiment. While coats and trousers were often eaten by moths after decades in closets or attics, many of these smaller decorative & rank accents survived. At the start of the American Civil War, Army regulations were not strictly enforced toward standardized uniform design. In fact, officers often purchased their own coats, hats and swords from private custom clothiers in larger cities. It was a chance to show some individuality and sense of unique persional style. In this case, we see a rather odd "rounded-border" variation to a Infantry Second Lieutenant's shoulder board. Regulations were tightened in the course of the war to set controlled requirements for size, construction and shape of uniforms & ecoutrements. Clerarly, the troops from various Regiments and differing States needed to recognize one another on the field of battle. This is a wonderful piece of Confederate equipment. It is an original Confederate manufactured canteen. In the Confederacy metal was scarce but wood was abundant. The resourceful Southerners used wood to produce their canteens. This one is an excellent example of the Rebel ingenuity. It stands 2-3/8ths inches tall and is 7-1/2 inches across. The wood is all present except for the spout which is so often missing in action with these canteens. You can see that the bands that hold the canteen together are hand made and the width of the metal varies in thickness at spots. It has all three of the original tin strap loops present. One side of the canteen has the letters �MBS� carved into the wood and the other side has the letters �SMAR� possibly representing the names of long-past owners. At the close of the Civil War, who would have thought that certain brass uniform buttons would be worth thousands of dollars? Even 140 years later, groups of the more-scarce items still surface upon the modern antiques retail market. These Maryland State coat-buttons were recently found in a jar at someone's grandmother's house. They are all uncommon and in superb condition, bringing their owners a surprising windfall of over $1000 as a group! That's more than mere chocolate chips in that Granny's cookie jar!!! This is an extremely unusual and attractive Union Infantry button in the spread-winged "Eagle I" pattern. The wings are skillfully-worked with much fine detasil in this die design, showing scores of individual feathers and a similar effect upon the letter "I" upon the shield which represents the infantry branch of service. The backmark, "Fine Gold Plate", is uncommon and attests to the pride that early & mid-Nineteenth Century button manufacturers took in making more and more durable high-sheen buttons. This came from the estate of Hallie Jones, a great grand daughter of many Civil War Period individuals. One such being Lieutenant H. J. Hunter who served from 1861 to 1865 in the Ohio Volunteers and is buried in Betheda Cemetery, Montpelier, Ohio. The various Union Corps had their own individual badges in order to help identify troops upon the field. But even moreso, the tradition was initiated to evoke a sense of unity & pride amongst troops who came from various states to serve together. This finely-crafted die-stamped brass arrow is indicative of the Union's 17-th Corps. It originally had a silver coating or "wash" which is wearing away from repeated cleanings over these many years. It has a loop for hanging from a uniform, but traces of solder on its rear suggest that it once had a bar-clasp-pin at the back. This is a very uncommon item! The men of the hard-fought Mississippi Infantry wore this button. It is a hard one to find these days. But then again, the men of that state were uncommonly tough tmemselves!!! True Texas Uniform buttons from the Civil War are as rare as hen's teeth. This one is in amazingly good condition for a dug button. On the modern marketplace, it would easily command over $1000... But to a true collector who has perhaps waited all of his life to own one, it is a treasured holy grail. Which young Texan carried it to glory or death in the name of the Confederacy??? This is a great relic from the heart of the Union forces at Gettysburg! A half of a Union smoothside canteen from the famous Spangler Farm. Besides the Federal combatants, it housed a hospital during the battle and was actually where Confederate General Lew Armistead was taken to die from his mortal wound received at The High Water Mark of Pickett's Charge! This farm was in private hands till 2008. The pewter canteen spout is marked by maker Gratz & Co Phila. It is no longer attached to the body piece but fits perfectly atop it. This is a very cool relic from the heat of the battle. This is a nearly mint State of Virginia coat button as used by the Confederates from that State. It has a lot of shiny gilt still upon its face and an interesting manufacturer's backmark from Horstmann & Allien of New York. It is interesting how many buttons and uniform items came from the north just prior to the war and were worn into battle against Union troops. Unusual Civil War 18th Corps Badge. The CW Corps Badge is 7/8" in overall height, appears Gilt and is pinbacked. The Civil War 18th Corps Badge has four 6 pointed stars in the design. The design of the piece is similar in style to the early badges that were sold to veterans as shown in Stanley Phillips' Corps Badge book. The piece is Nicely made, uniquely attractive and finely hand-detailed. Civil War Vets loved to proudly wear such devices on their coats as reminders of their Civil War service. These are two halves of a Union "US" beltplate that were discovered many years ago at a Civil War battlesite after a heavy rainfall. It is amazing that erosion can still bring up items from over a hundred years ago! The particular place where objects lay in the ground will determine what chemicals and minerals will affect them over time. Ground water can also cause corrosion. And the freeze-thaw cycle of winter can cause stress fissures or breaks in even metal items. It is sad to see items that are crumbling to nothing because the ground in their area has been too hard on them. Yet there are other times when a relic hunter's shovel will turn over dirt with a piece of preserved cloth or leather that has not rotted away since the 1860's! Civil War artifacts are like people: Some are more fragile while others survive longer under much tougher conditions. As soldiers will tell you, it's not just skill but also a lot of luck! These objects come from a very old Civil War collection and were collected under legal parameters in their day. This image shows a Civil War officer's shoulder "rank" board. It has a metal frame known as the "Smith Patent Type." Sadly, over many decades moths liked to feast upon the cloth of caps, uniforms and even the background blue-colored "nap" of this board. It was riddled with moth holes when I received it. But happily, the dark blue material survived much better on the backside of the strap. So with careful piecing together like a jig-saw puzzle, the original material was harvested from the back to the frontside rank field. The photograph shows a "before" and "after" view. There are specialists for restoring many categories of historic Civil War militaria, such as photographs, documents, flags, textiles, firearms and belt plates. Not only do restored items look good but they also visually come back to life to the imagination. And sometimes, restoration stabilizes & preserves items that become very fragile when left in pieces which continue to deteriorate. This is a quite unusual yet extremely historic item for the discerning collector of Southern relics. A huge, hand-forged "fork tongue" belt of iron on a par with the best folk art pottery and crafts of the South. It has a super story behind how, where & when it was found: Comes from the direct descendant of its recovery. Here is his quote about it: "This is a rare type of forked tongue belt buckle found on my mother's family's land back in 1963. The buckle was found on the grounds of Ginter Park School, which at the time was part of my our land off Hermitage Rd in the North side of Richmond, VA. It was kept by my Great Grandfather and was given to him by family friend Margaret W. Morgan who found it in 1963. The label was written by my Great Grandfather and displayed with the family's heirlooms until the property was sold in the late 1970s. The estate was called "Willowbrook" and is now a school for dyslexic students and is part of the Richmond Historic Foundation. This provenance goes back to the 1960's, but it is impossible to know for sure if this actually was worn by a soldier during the Civil War. This buckle must have been custom made by a blacksmith." Indeed, the belt is solid, well hand-forged iron of substantial heft: A big 5" long by 3 1/2" wide with a massive snake-like forked togue to pierce the holes on the belt leather. If this was a man's belt, he was clearly quite a large "man's man"... There is the remote possibility it was made for saddle tack, but I doubt it, for this has the exact build of slightly smaller Confederate soldier's fork-tongued belts. There are no markings on this. Tongue is intact with nice points and free-sliding along center bar. A light covering of minimal rust but totally stable. The original tag that came with this through the family is still with it. Reads: "Iron buckle found by Marg. W. Morgan on grounds of Ginter Park School./ Richmond, Va. 1963." This is a one of a kind item which seriously represents the Old South. There unlikely would be another like it. Union Plates and Leather from Under Floorboards! Things pop up in the craziest places! We've all heard stories about "Confederate" gold hidden behind walls, or old muskets dropped down abandoned wells, or skeletons "in the closet"... but things like this really happen. I've had bayonets and buckles found hidden in the trunks of old trees that were found by kids who are now in the eighties! Well, this Union cartridge box cover with its old brass US plate was found under the floorboards of an old house that was being demolished in Tennessee! Along with it came an Eagle Breast plate. Apparently, some old veteran hid his war souvenirs there and either forgot them or passed on. When such things happen, you wonder is it just luck, coincidence or Fate??? Identified Corps Badge to man at Gettysburg! This is a beautifully engraved silver I.D. badge for a Corporal John Soord from Company K. 90-th Pennsylvania Regiment. This man fought at Gettysburg and his name is on the PA. Monument which still stands where he once fought. Yikes! Would you want to march off into battle with the number 13 on your back? This is a wood framed leather knapsack with regiment number 13 in white paint on rear outer flap! Inside of flap is written name of soldier "J.A., Stewart. Co. E." in ink. There were LOTS of Stewarts in the Civil War, so I am not certain which man it was. These hard knapsacks were used prior to CW by State Militias and carried into the early days of the Civil War conflict. Later knapsacks were the cheaper tarred canvas ones. This one has some minor tears and needs some edges tacked back to frame. As is typical the outer leather straps have broken away and been lost, but as you see from photos, one main rear shoulder carrying-strap still remains. This type of item is a great restoration project for determined leathercrafters. Often seen on backs of soldiers in early CW images. This is a Civil War New York State coat button from estate of First Lieutenant George T. Taitt who served in 1862 with the 142 New York Infantry Volunteers. It is in very good shape with a nice Horstman & Allien N.Y. backmark. Three pieced domed contruction at big 22 millimeters. This is a very large canteen made of a dense (walnut? )wood that is pieced tightly in segments. It has custom-forged iron straps. This is most typical to the " Gardiner`s " type that the Confederates used during the Civil War conflict. The "MC" carved in its face could be the owner's initials or stand for "Medical Corps". Too big for one trooper to carry, it was meant to serve many on the field after battles. In camp, a keg or small barrel would have been used. So, this went out on the fields! Measures a big 3" wide and 11 1/2" across. This is a Colt leather holster from Civil war in relic condition. It has the brass tab for a flap; the proper stitching; the 5 brass rivets which held a belt loop. In any case, a nice field pickup from some battle ground... This is just the body. No loops or flaps. About 11 inches long; About 4 1/2 at tab across. Gettysburg Camp Plate with melted rear Lead. This is a wonderful relic found in 1980's along Baltimore Pike on private property by Dwayne Thompson. It is a battered brass Union eagle breast plate with its rear lead-fill being melted and run out of the back by the heat of a fire. Unclear if it was a battle-related flame or just from the heat of a trash pit at a Union camp. There is an old pine needle still embedded in the melted lead! Wow! These are really, really hard to find in decent shape. Like hen's teeth! A maroon Officer of the Day waist sash! It has it's end knots with tassles. The wrap at neck of one knot has been replaced in past. There are a few small nips in sash but overall it is amazingly intact & fresh. It measures approx. 3 1/4" wide and 58" long! Often seen on CDV photographs of soldiers from Civil War, tinted red by photographer. This is a cool flag pole brass base mount from first days battle at Gettysburg. Dug west of McPherson's Ridge along Chambersburg Pike. From an old collection in days when much land in area was still private and many first generation relic hunter were welcomed with their primitive metal detectors onto old battle sectors. These are seven various "coin buttons" that were found by walking Gettysburg battlefields in the 1960's when those areas were still private land. They are the kind worn on vests and homespun coats by Rebs who often mixed civilian attire with scant military issues. Comes in a plastic snap-lid box with old labels. Way cool! This is an original German Silver star-design corps badge for the 20-th Corps. It has a blue background of felt in its insert pane. It is Civil War era with a "C-clasp" pin on back. There is a stippled edge design that was hand-done. These were alwas made with great craftsmanship!They were still used into post-War era for GAR veterans meetings & public events like parades. This is a Civil War 16-th Corps Badge made of German Silver, nickel and copper coomposition popular during the CW era for badges. This has nice hand-tooled scalloped edge design around borders. Has the Civil War era T-clasp on the back. No markings on it. These can date from 1865 to 1875 era. The 16th Army Corps was organized February 18, 1865 consisting of the infantry divisions of the Army of the Cumberland. Major General A. J. Smith was named corps commander and remained commander until the 16th was discontinued on July 20, 1865. This is a fancy large coin button from Antietam area. These were first often used in Colonial America. Some still found their way years later onto CW battlefields. This has a cool design that almost looks like a Native American Shield. This is a very nice Light Artillery button circa 1820. It has some gilt remaining and nice shank. Backmark is fancy older "Robinson Jones & Co. Attelboro. Cool eagle over cannon & flag motif. 23 millimeters. Not an easy one to find in such nice shape! 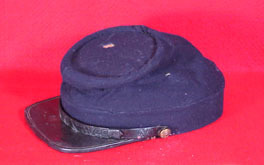 This is a cool Nineteenth Century blue kepi with a green rim of material. The buttons are plain. No makers marking inside. Brown cotton liner like in Civil War era kepis. I am not sure if it is from a military academy, a band, or military medical personel like an orderly because of the green rim band. A rather unique item. This is an originsal bullion insignia for a CW Hardee Hat which was sewed onto the side of the soldier's tall headgear. This one seems to be an unused surplus example. Not use of various bright wires to make design and border. This is a Civil War "Bird Colonel" shoulder rank strap insignia. It has a few moth nips to the background field. But that just shows it was brought home from the War to a closet, rather than being some unused "surplus" item. Measures: 3 7/8" by 1 3/8". Open back canvas construction is fully typical to Civil War era. CW Colonel boards are tough to find! This is an original Union cap pouch that bears an affixed early collection-label reading in old cursive ink: "Gettysburg"! It was from an early museum collection located in Gettysburg which was sold off years back. The leather is still pliable. Though worn, it is a super early Gettysburg relic, most likely collected off the battlefield by souvenir hunters relatively soon after the battle. These are big "triple bordered" custom shoulder rank boards for a Union Major. With this higher rank and bearing the "M.S." for Medical Staff, he was likely a surgeon. After Civil War, rank straps were standardized and custom-made boards were no longer allowed, especially the double- and triple-bordered varieties. This is an amazing collection of original Civil War items belonging to Union Lieutenant Rowland R. Hazrard (1837 - 1921). He served for a few months in 1861 in the 1 st Rhode Island militia, but then from 1863 - 1864 in the 14 th Rhode Island Heavy Artillery. There, he was a white officer to a "colored regiment." This unit served in the New Orleans theater of war. In this collection of his war momentoes, we find: 3 rank shoulder board sets; 1 bright Engineers & Artillrist coat button; 3 hat insignia; and 5 military tactics books, inscibed with Hazard's name. One book was presented (inscribed) to him by Samuel Bishop, a Captain in the 11 th Cavalry at Ft. Jackson, LA. Sadly, the outsides of the books have varying degress of waterstaining and cover loss from poor storage over the years. But the inscriptions, title pages, and insides of books are just fine. Two of the hat insignia are superb: a lovely embroidered Hardee Hat badge with various gold wire and sequins, and an 11 th Artillery embroidered hat emblem with the factory maker's initialed tag on back. (Hazard was very briefly in the 11th Artillery Regt too.) The 3 rank shoulder board sets include Second Lieutenant of artillery with mothing loss to part of red fields; a First Lieutenant of the Infantry (hard Smith type); and an astonishing large "double bordered" First Lieutenant of the Artillery set. Double borders ceased to exist after Civil War. This collection came with various databank references to Hazard and his Regiments. There was also a photograph of his actual grave marker! This is a neat set that honors a man who worked his way through the Civil War in honor of Rhode Island and in support of the Union. This is a Louisianna State Coat button from the Civil War showing the pelican feeding her chicks. This is a cute ambrotype photograph of a young child in her big Civil War era dress. Her dog Nipper stands next to her. Part of the reason we collect and sell CW artifacts is to complete the historical record which otherwise would be lost to time. There is nothing more thrilling than discovering the name of a soldier on a letter or behind a photograph, and then, doing some research. As a CW dealer, the satisfaction as a hobbyist helping other collectors far-outweighs the profits. Recently, I sold a simple Union Artillery cuff button to a collector. Little did I know: that button meant a whole-lot-more than a mere button: It was the last button needed to restore the uniform jacket of an actual Civil War soldier! The collector had fulfilled the process of "filling-in" history. I had helped a bit. Here is a photo of that trooper's uniforms (Courtesy of Michael Cunningham, Ph.D.). The soldier's name was: John Gilmore Dean, an 18 year old farmer from Portland, Maine. He enlisted on Sept. 3, 1862 as a private and was mustered into the 6th Battery of the 1st Maine Light Artillery. Dean was described as having blue eye, light hair, light complexion and a height of 5� 7�. Dean was promoted to Corporal in Nov. 1862, to Sergeant in Oct. 1863, and to 2nd Lieutenant on July 1, 1864. On Oct. 14, 1864 he was appointed as an Assistant Aide De Camp on the Staff of Chief of Artillery, to Major John G. Hazard at the Head Quarters, Artillery Brigade of the 2nd Army Corps. On Dec. 30, 1864, he requested his first leave of absence in order to go to Portland, Maine to purchase a house for his mother. He was Mustered Out on June 17, 1865 at Augusta, ME. The regiment lost 13 enlisted men killed or mortally wounded and 27 enlisted men to disease. It is honored by a monument at Gettysburg. These lovely dress epaulettes were found in a Hudson River Valley attic. Apparently, the family claims that an ancestor, last name Curtis, wore them in the Civil War. But no further details known. These have padded embroidered insignia button indicating the Second Regiment. One has a small General Staff button still on it. The coiled bright bullion wires are intact and unstretched. The underside pads and hardware intact. Some tarnish on brass but no corrosion. This is a super Confederate Cut Sheet Brass "clip corner" type belt plate of CW Era Vintage. It is consistent with CSA manufacture. It was purchased from a house near Winchester, Virgina, but has no other exact history. Because it is non-dug, it still has it's soldered belt bar and attachment clip. (Dug ones always lose these underground) There is a warm honey patina to face brass. No markings as these were usually made in local, small metal shops. About 2 3/4 by 2 1/4". This 18-th. Corps Badge is a Jeweler and Engraver�s masterpiece. Jeweler cast in solid gold and beautifully hand engraved and enameled to the 18-th. Corps, 46-th. Regiment, Massachusetts Volunteer Militia and the Red Star Brigade. Obverse showing superb enameling in Blue and Red with the addition of twelve Mother of Pearl gems in Flower designs. Engraved: Co. A. 46TH. Reg. M.V.M. Badge measures 1 �� x 1 �� x 3/32� and weighs 10.3 Grams. Reverse of badge is engraved to: D.J. Marsh (2nd Lieutenant Company A, 46 Regiment Massachusetts Volunteers). Likely created in post-war Veterans' era. Donated photo. A white cotton coat to cover the clothes of Medical staff from splashes of blood and body fluids in wards and operating areas. It has original gutta percha "Goodyear" buttons. These are quite uncommon now. This is a super-condition, original U.S. Army Regulation Model 1855 Non-Rigid or �Soft-pack.� This example commonly referred to as the �two-bag� pattern, as well as, "two bags". The exterior bag has a flap secured by strips of rawhide and the interior bag has four triangular-shaped flaps secured by straps and roller buckles. Considering that the tarred linen deteriorates in damp barns, warehouses and basements if not cared fore properly, finding one is such a very fine condition is uncommon these days. It has all the original straps, hooks and buckles. The leather is sound and supple, with just some scattered crazing / flaking. The tarred linen is overall quite pliable only a few small holes at a couple of creased openings and folds. One of the weather protective flaps has come loose � these are not sewn in but were glued in place with the tar-painting. So, an easy fix; the other flap is secure. These original Civil War backpacks, were once common as dirt but now are getting exceedingly hard to find � particularly in a any presentable condition. The seller who I got this from says he "climbed up in an old collector�s barn in Virginia to retrieve this and several others he had stored up there, back in the early 1970s and fortunately, they had weathered well." The secret to preserving these tarred-linen packs for display is to wait for a very hot & sunny day; get some newsprint and lay it out on the newsprint. In a couple of hours this piece will be as pliable as it was in 1864. Then while still pliable, stuff the bags with acid-free paper (be responsible) to get the proper shape. These packs are invariably marked with: �R. Valentine / U.S, Inspector New York / 1864� on one leather strap. This particular specimen has a weak stamp (see photo) on one of its shoulder-straps that has the latter portion of � - - Valentine� and �- - Inspector� and further down what looks like the tail-end �1864.� These back packs are actually documented in photographs as being deployed for use during the Civil War. They wore out quickly on the road, so one still in great shape is rare. Both straps so some evidence of once having been secured at buckles, so this was likely in actual use by a Union trooper. This is an stellar-condition CW Union Cavalry gold-wire embroidered kepi insignia. It is bordered in thin gold wire which is typical of CW era. Plus, a nice canvas backing with two brass wires. Upon it's lovely black cloth backing are mounted two brass insignia for Regiment (4) and Company (a Gothic A.) Some slight age toning to brass. About 3 1/2" by 2 1/4". This is an absolutely lovely custom made Civil War kepi insignia for the Topographical Engineers. Quite a rare bird indeed! It is intricately woven from gilted wires into a wreath which surrounds an elaborate US shield. The accenting red and blue in the shield makes the device "pop" from the black felt background. These were custom ordered from CW Military clothiers for higher-ranking soldiers. Overall 2 3/.4". No mothing. Just lovely workmanship. This is a very rare original Civil War Era gray Confederate shell jacket. It has stag bone buttons. Soldiers improvised when government issued metal button ran out. It comes in "as found" condition from an estate in Chambersburg, Pennsylvania, right along Lee's retreat route! It was completely hand stitched and has several field repairs to its material. Looks like something that came straight from a battlefield. Rough size: 16" across the shoulders; and 20" back length. Rare! This is one of those rare original artifacts collected right off the Gettysburg battlefield by local families in the months after the battle! It is a battered Union cartridge box. Everything including flaps, straps, roller buckles is there, but stitching is split along one side causing an opening there if pulled. It has an old tag from The Dobbin House in Gettysburg which reads "Ford Family Culp's Hill". The Dobbin House is still there as a fine, charming restaurant popular with tourists. Items with such specific tagged provenance from Gettysburg are getting quite rare. Custom officer "shoulder boards" or rank straps for their military uniform coats were often purchased by proud officers from Military Clothier Companies. Something fancier and special was sought. So, double and triple bordered straps appeared as large, impressive "custom" items. Here we see three varieties of original Civil War rank boards of this type: Triple bordered Colonel of Cavalry (uncommon), the blue double-bordered Lieutenant Colonel of infantry (rare), and the yellow double-bordered Cavalry Captain's (less common than infantry). Such custom straps were prohibited after the Civil War. So, this dates them to the American Civil War. These show actual field use! A very nice image which was donated by CW Enthusiast Andrew Harris. This is an especially attractive, well made 24-th Corps Union Artillery Badge. Unclear if from the Civil War era or just afterwards for proud GAR veterans. It is a lovely piece and quite rare. This is a great dug relic US Puppy Paw US belt plate which come from former collection in East Tennessee. Found on private land with owner's permission in Maynardsville, TN. This plate is forced into a jelly roll shape! It is all their, including puppy paw studs toward the inside! Since a plate would be a lot of work to curl, it seems unlikely that anyone would do this simply out of mere boredom. Rather, sheer anger seems more likely: Perhaps a rebel in anger at his captured enemy's US symbol?